Notes: Gail Kim won a Gauntlet Match to become the first TNA Women's champion. 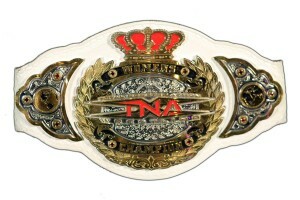 The title would later become known as the TNA Knockout's title! Notes: Taylor Wilde accepted the $25,000 Fans Challenge and defeated Awesome Kong for the TNA Knockout's title. Notes: Angelina Love defeated Awesome Kong and Taylor Wilde in a triple threat match inside the 'Six Sides of Steel' to win the TNA Knockout's title. Notes: Angelina Love defeated Tara after the Beautiful People offered sexual favors to referee Slick Johnson. Notes: Cody Deaner and ODB defeated Angelina Love and Velvet Sky in a match where Love's Knockout title was on the line. Deaner pinned Sky to win the match and the title. Notes: The Knockout title was held up and Cody Deaner was forced to wrestled ODB for the championship . Notes: ODB defeated Cody Deaner to win the vacant TNA Knockout title. Notes: Angelina Love won a special key in a Lockbox Showdown match which unlocked the box containing the TNA Knockout title! Notes: TNA Knockout Tag Team champions The Beautiful People (Velvet Sky and Madison Rayne) defeated Tara and TNA Knockout champion Angelina Love in a steel cage match with all titles on the line - the finish saw Madison Rayne pin Tara to capture the TNA Knockout title! Notes: Angelina Love won the TNA Knockout title fair and square. Notes: Tara defeated Angelina Love (c), Velvet Sky, and Madison Rayne in a four-corners match to win the TNA Knockout title. Tara was supposed to be helping Madison, but she pretty much won the match by accident. Notes: Tara made good on her deal and laid down to allow Madison Rayne to pin her for the TNA Knockout title! Notes: Mickie James defeated Madison Rayne in a "hair vs. title" steel cage match to finally win the TNA Knockout title! Notes: Velvet Sky beat Winter (c), Mickie James, and Madison Rayne in a four-corners match to win the TNA Knockout title! Notes: Taryn Terrell beat HAVOK (c) and Gail Kim in a triple threat match to win the TNA Knockout title! Notes: Jade defeated Madison Rayne and TNA Knockouts champion Gail Kim in a triple threat match to win the title. Notes: Sienna defeated Gail Kim and TNA Knockouts champion Jade in a triple threat match to win the title. Notes: Allie defeated Jade, Marti Belle, Madison Rayne and TNA Knockouts champion Sienna in a 5-way match to win the title.